The search for relief from stress and anxiety is leading some to the ancient art of sound therapy. 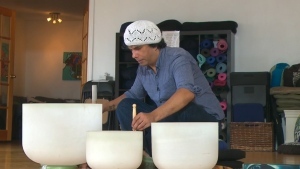 Practicing at Toronto’s Helix Healthcare Group, sound therapist Philip Jacobs uses an array of large crystal bowls to create powerful vibrations. Diagnosed with post-traumatic stress disorder, anxiety and depression, Laura Lockhart visits Jacobs twice a month for hour-long sessions. Bathed in low frequency sounds that bring her to a meditative state, Lockhart says the therapy is able to help her in ways that medication never could. The practice, which dates back to early Egypt, is gaining modern followers. However, the therapy lacks rigorous clinical testing to prove it works and some scientists are skeptical. Others, like Bernhard Ross, a Toronto-based biophysicist, are curious about how different sounds affect the brain. 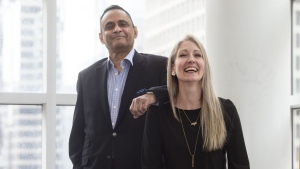 “[There’s a] strong hypothesis that sound can directly interact with brain rhythms in those brain areas which are affected in anxiety or depression ,” Ross told CTV News. Low frequency sound rhythms can slow down the heart rate and brain waves create feelings of relaxation, he added. Ross says that it’s still unclear how long those effects can last. But Lockhart says that sound therapy has helped keep her off antidepressants for three years now. 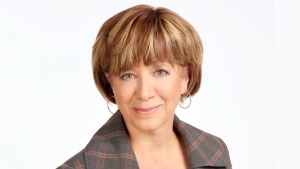 With files from CTV’s medical specialist Avis Favaro and producer Elizabeth St. Philip.